In this workshop we will be investigating how an embodied understanding of the concepts in facial research can enliven our movement sensibilities and expand our choices. · The diversity of ways that our quality of touch affects the mechanoreceptors in our connective tissue. 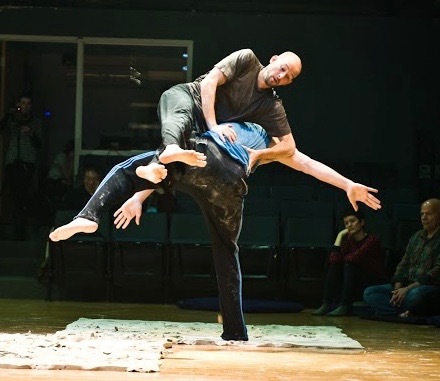 · The evolving whole: playing with both composition & connection to touch into the poetics of the dance. Luxuriating in our floor work we will utilize this aspect of the dance as a foundation for nuanced unfolding communication and palpable connection into the core. Through a moving form of simultaneous reciprocal bodywork, we will explore the dynamic relationship between compression and release that leads naturally into expansive dancing. That’s what we need to average to put this event on. Pay what you feel is right for your financial situation and how much you value the offering. It can be above or below the scale range. to pre-register in case of cash/check payment. In front of Loft I entrance; across the street; lots of extra parking behind the building – drive to the end of the building complex and turn and follow the road (tracks) to park across from the park/picnic table area – enter back door and follow upstairs and around the hall to the NYS3 studio.